Getting away from reality is good for the soul, and getting away from the usual workout routine is good for the body. However, a vacation can be the perfect time to exercise. By freeing yourself from your routine, you open your mind to new ways to move your body, have fun and keep your body fit while you're on vacation. Beach volleyball. You can burn more than 150 calories an hour, depending on how hard you work and it's a great way to meet other people at the beach while having fun. Surfing, swimming, and snorkeling. Surfing is a total body workout that will challenge every muscle in your body. 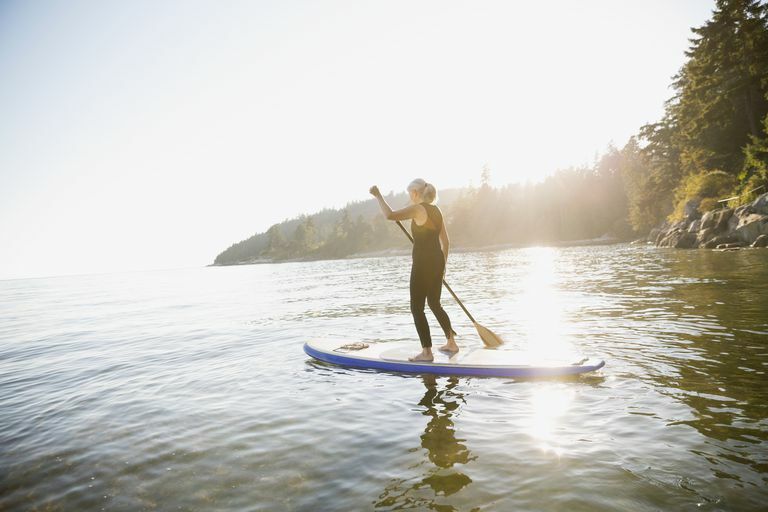 Even if you just paddle out to the waves and fall off, you'll get a great workout. Snorkeling is a bit more leisurely, but you can add intensity by swimming a little harder. If you're at a beach that doesn't have big waves, put on your snorkel gear and swim out and back for a few laps to get your blood moving. Leisurely bike rides. Long bike rides are a great way to see the area while getting ​in some low-intensity exercise. If you take your time and go all day, you'll burn calories without even thinking about it. Hiking. Anytime you add elevation to your walks, you'll burn more calories. If you carry a backpack, you'll challenge yourself even more, all while enjoying a little nature. Check with your hotel concierge to see about hiking adventures nearby or visit Local Hikes to find trails near major metropolitan areas. Golf. Golf can be a dud of a workout if you ride around in a cart and drink beer at every hole. If you want to burn more calories, though, carry your clubs and walk the course. You'll burn around 200-300 calories per hour. Tennis. Like golf, a game of tennis can be as easy or hard as you want it to be. Chasing the ball and hitting it like you're Serena Williams or Roger Federer will give you a great workout, burning up to 400 calories for a 150-pound person. Shopping. OK, maybe shopping isn't the highest intensity activity, but it can be very aerobic under the right circumstances. If shopping is your activity of choice, make it count by walking fast, taking the stairs, and avoiding fatty foods at the food court. Finding fun cardio activities is easy when you're on vacation. Lifting weights, however, presents more of a challenge. You usually don't have much equipment and the thought of going to the hotel fitness room isn't that appealing when you're trying to have fun. You don't have to do much, however, to maintain your strength and muscle while you're out of town. A quick workout with body weight exercises, resistance bands or full water bottles will keep you strong and fit until you get back home to your usual routine. Aerobic power can decline 5-10 percent in three weeks. The fitter you are, the faster you lose your fitness, which doesn't seem fair, does it? You tend to lose aerobic capacity faster than muscular strength. Muscles are resilient and retain a memory of all those exercises you did. Taking a week off probably won't make much of a difference but, any more than that, and it may be harder to get back to your previous levels. Finding ways to stay as active as you can will keep you fit, help you avoid weight gain and make the transition back to real life a little easier. American College of Sports Medicine. ACSM’s Guidelines for Exercise Testing and Prescription - "Maintenance of the Training Effect." 7th ed. Baltimore, Md: Lippincott Williams & Wilkins; 2006.